Like Captain Atom, Blue Beetle was a Charlton Comics character. When Charlton's characters were bought by DC Comics in the 1980s, DC incorporated the characters into their own universe. As it turns out, the Blue Beetle in this review - alias Ted Kord - is actually the second third Blue Beetle. The original, named Dan Garret, started out as a Fox Features Syndicate character in the late 1930s. When Charlton bought the rights to Fox's characters in the early 1960s, they briefly used a completely revamped Dan Garret version (renamed to Garrett) as a superhero empowered by a mystical scarab dug up in Egypt. Ted Kord, friend and protege to the original Blue Beetle, Dan Garrett, assumed the hero's mantle when Garrett was fatally injured in combat with robots commanded by Ted's Uncle Jarvis. Unfortunately Ted did not inherit any of Dan's superpowers and instead studied a variety of martial artist skills, and invented a multitude of non-lethal weapons, none greater than the "Bug," his solar-powered, stealthy, crime-fighting vehicle. It's a well-known fact among comics geeks that the Ted Kord Blue Beetle was partially the basis for the character of Nite Owl in Watchmen (just as Captain Atom was the model for Dr. Manhattan). 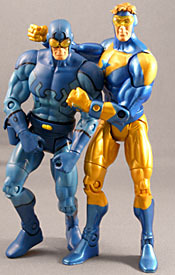 Blue Beetle's most popular era was probably in the late 1980s, when he and Booster Gold became goofy best friends during Keith Giffen and J.M. DeMatteis's run on Justice League International. Unfortunately, Blue Beetle was recently a victim of Dan Didio's endless quest to kill every superhero at least once during his tenure as DC's Editor-in-Chief. However, there have been hints Ted may have returned thanks to a time-traveling loophole. Blue Beetle comes on the standard DCU blister card in a fairly dynamic action pose. While I can appreciate the appeal of a dynamic pose to MOC collectors, I think it too often ends up interfering with the quality of my figure. In this case, however, Blue Beetle turned out fine. Blue Beetle uses the "slender but still buff" male body seen on Nightwing, the Flash and Mister Miracle. The new tooling is the head, belt, and BB (Blue Beetle) gun holster. I really like the head sculpt. The expression captures the quirky, likable character of Ted. The clear goggles are also a nice touch, though it's difficult to see the eyes behind them. Blue Beetle has a very appealing color scheme, and Mattel has done justice to it. 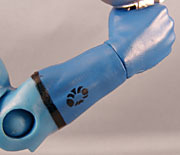 The figure is largely molded in light blue and offset with a darker blue. The black trim has been applied fairly well and consistently for a mass market figure, particularly on the chest and back, although there's just a tiny bit missing around the top of the "antennae" above BB's goggles. There's also a slight shade difference between the blue of the thighs and that of the knees/calves, which I didn't actually notice until Dr. Mrs. The Ghostal pointed it out to me. It almost looks like a light wash was applied to the thighs but not the lower part of the legs. The nicest little touch is the tiny beetle symbol tampographed onto BB's right forearm. I don't know enough about the character to say how accurate it is, or whether there should be one on the left arm as well, but it's well done for such a tiny thing. Blue Beetle has a great balljointed neck with a good range of motion; balljointed shoulders; H-hinges at the hips, allowing for a balljoint-like range of motion; hinges at the elbows, abdomen, knees and ankles; swivels at the biceps, wrists, lower thighs and waist; and some slight rocking motion on the ankles as well for wider stances. 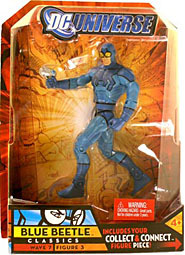 Blue Beetle comes with his BB gun, which I have to say looks exactly like my wife's hair dryer. But from my cursory internet image search, the Horsemen do seem to have based the weapon on its general look in the comics (just as they did with Captain Cold's gun). It's certainly unique, which is a plus form this sort of accessory. The gun fits snugly in the holster, which can even be snapped closed. The figures of course includes his piece of the DC Universe Series 7 Build-A-Figure, Atom Smasher. Ted comes along with the right leg, a piece that's nearly as tall as BB himself: it's 5" from heel to hip. Usually there's not much to see on a leg, but Atom Smasher's design is interesting even broken down into components. The piece moves at the ankle, knee, thigh and hip. Other than a few minor paint issues, my Blue Beetle is a solid figure. I didn't even have a single stuck joint, which was true for this entire series (except for Aquaman). While Blue Beetle has very little new sculpting, the head sculpt is excellent. But what really impresses me are the great paint applications, particularly the dark blue and black trim. They make an otherwise average figure into an exemplary one. The clear goggles and holster for the BB gun bump him up as well.